Water leaks cause damage to the internal structure of chimneys and can incur heavy costs. Chimney rebuilding provides an environment-friendly solution to the threat of water damage. A simple hairline gap in your chimney frame can cause serious harm to the overall structure. It is the job of an experienced professional mason to know all about masonry construction and perform the rebuilding process with the highest quality of materials. Beginning at the bottom of the chimney from the least damaged area, the professional will make sure the excess mortar has been removed from the joints and fixed firmly for a clean and professional look. Most rebuilds in our area are from the flashing up to the crown. We do this because your chimney may already be deteriorating even where you don’t see evidence of it. To rebuild a few courses or 15 courses down, the same set up of scaffolding is needed. It doesn’t take much more time and not too many more bricks to do the job right. Why chance chimney repointing or rebuilding the chimney just a few courses when you can go down to the flashing? This will be smart spent money on your chimney repair. Waterproofing – Exposure to the elements often results in serious spalling to the chimney. Our waterproofing service prevents water from penetrating the structure. Crown repair – Repairing the crown of your chimney is another way to prevent water from wreaking havoc. Our inexpensive repair method uses up-to-date materials to give your chimney maximum protection. Chimney damper – Installing a damper system on the top of your chimney allows you to shut the flue when needed. Our chimney rebuilding process ensures that the job is done right the first time! Sure, we all would like to save a little money, but a low price is good only if the service solves your problem. Many times, we hear customers and home inspectors use the word “repointing.” While this may seem to be a solution for most repair jobs, often a chimney is in need of more than just repointing. 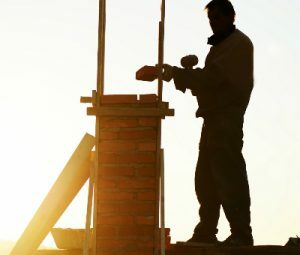 Chimney rebuilding costs can be very affordable. In many cases, the cost to rebuild a chimney can be as low as $1200 for a single flue stick structure. Many chimneys have a fireplace or two in them (more flues) so, of course, the chimney will be larger. The average price to have a chimney rebuilt is $1850-$2500, depending on a few specific details about your chimney. It’s generally less expensive than chimney replacement options. Give us a call, and we can determine what your chimney rebuilding cost will be. The services offered by Creative Masonry & Chimney are backed up by our dedication to customer satisfaction. Our team has in-depth knowledge about using the right kind of brick and mortar to accommodate any weather conditions or location. The work performed by Creative Masonry & Chimney has no comparison in quality workmanship and standards. We will provide you with the best chimney repairs and customer service—guaranteed. Call us now!